I have to be honest with you; some days it’s difficult to put two words together. These days seem to coincide with the days my brain decides to bubble, lose molecular stability and then decides to ooze out of my ears. It’s at that point when anything I decide to write begins to sound like the ramblings of a mad man, who also has issues spelling korektlee...I mean correctly. Thank goodness I have my better half to point out every. single. mistake. I. make. (love you!). A new Social Media Guidelines section, with information on using tools like Facebook and Twitter, as well as 42 separate entries on such terms as app, blogs, click-throughs, friend and unfriend, metadata, RSS, search engine optimization, smart phone, trending, widget and wiki. New terms like; Great Recession- referring to the 2007-08 economic downturn that was the worst recession since the Great Depression, and tea party, for the conservative political movement, along with new entries for Alcoholics Anonymous, Bluetooth, Blu-ray, bondholder, Breathalyzer, flu-like, GED, International Space Station, mic -as the shortened form for microphone, hard line, high-five, Taser, thumbs-up and Ultimate Fighting. The app normally costs $24.99, but is discounted to $19.99 for early adopters- who will get the 2010 app, plus a free upgrade to 2011 this spring. Pricing for the AP Stylebook is high, but if you’re looking to separate yourself from the rest of the pack, it may be worth a look. Check out the press release after the jump. NEW YORK, March 24, 2011 – The Associated Press, the world’s leading source for news and information, today announced the availability of the AP Stylebook mobile application for BlackBerry smartphones. The app, priced at $19.99 for early adopters (regularly $24.99), will provide users on the popular mobile platform with “on the go” access to the essential writing tool for journalists and communicators. Updated annually since its initial print publication in 1953, The AP Stylebook is a must-have reference for writers, editors, students and professionals. In addition to providing fundamental guidelines for spelling, language, punctuation, usage and journalistic style, the AP Stylebook is used daily by news organizations and communications professionals around the world and is considered by many to be the definitive resource for journalists. "This application for BlackBerry smartphones will enable us to reach one of the broadest networks of smartphone users and further expand our family of mobile products," said Colleen Newvine, product manager of the AP Stylebook. "Not only will Stylebook Mobile on BlackBerry smartphones provide style guidance to a new group of mobile users, but it also expands the availability of Stylebook content for our members; many of whom rely on BlackBerry smartphones in their daily reporting." According to figures released in January by the TNS research group, BlackBerry remains the leading smartphone operating system for business users—69 percent of businesses continue to use BlackBerry smartphones. For enterprise businesses, or companies with 1,000 or more employees, BlackBerry smartphone usage jumps to 81 percent, TNS research shows. The genesis for the new app for BlackBerry smartphones not only lies in market demand, but direct requests from Stylebook users. “Since we launched Stylebook Mobile for iPhone, many of our Twitter followers have asked us for a BlackBerry version and we’re happy to respond to that request,” added Newvine. The release of AP Stylebook app for BlackBerry smartphones follows the successes of similar AP technologies. 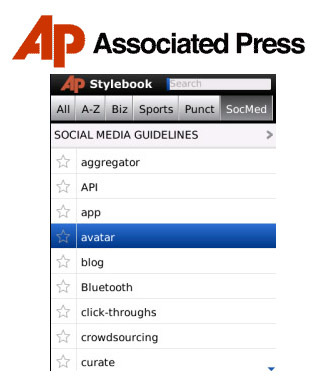 The AP Stylebook Online and the Stylebook app for iPhone have been widely heralded by users and together were a recent finalist for the Gannett Foundation Award for Technical Innovation in the Service of Digital Journalism at the 2010 Online Journalism Awards. This latest version of Stylebook Mobile contains all of the content from the spiral-bound Stylebook, including rules for how journalists should use social media, sections focusing on sports and business and the broad A-Z listings. In addition, a few recent style guideline changes went into effect last week: email is now without the hyphen and cellphone and smartphone are each one word instead of two. The Stylebook also is adopting Kolkata as its style for the Indian city formerly known as Calcutta. The mobile app for BlackBerry smartphones contains enhanced search functionality, fast page loading and live links to websites for real-time information. The Associated Press is the essential global news network, delivering fast, unbiased news from every corner of the world to all media platforms and formats. Founded in 1846, AP today is the largest and most trusted source of independent news and information. On any given day, more than half the world’s population sees news from AP. On the Net: www.ap.org.